Tooth bleaching is considered to be conservative, noninvasive and cost effective treatment modality in regards to esthetic consideration. Inoffice bleaching is one of the types of vital bleaching. Most current office bleaching products contains high concentration of hydrogen peroxide which in turn has various deleterious effects on tooth structure, pulp tissues and mucosal tissues of the mouth. In addition, the high concentration often causes postoperative dentin hypersensitivity. In view of the safety, lower concentration of bleaching agent is desirable. Recently visible light activating Titanium dioxide has been introduced as photo catalyst which lowers the concentration of hydrogen peroxide by accelerating its breakdown thereby enhancing the rate of bleaching. The aim of this systematic review is to know the influence of lower percentage of hydrogen peroxide on the bleaching efficacy and tooth sensitivity in TiO2 containing inoffice bleaching agent in randomized clinical trials. Dental bleaching has been considered the most accepted dental treatment in regards to esthetics as it provides conservative, non-invasive and cost effective treatment. Inoffice vital tooth bleaching is one of the techniques where the bleaching agent is applied in the office by the dental professionals [1-5]. The advantages of an in office bleaching over at home bleaching techniques are control over procedure , prevention of deleterious effect of bleaching material on soft tissue without its ingestion, reduced total treatment time, provides immediate results and increases patient satisfaction and compliance . The most commonly used in office bleaching agent is hydrogen peroxide. Hydrogen peroxide is an oxidizing agent. It produces free radicals and these free radicals then act on the pigmented organic molecules which are further broken down. These broken down molecules will either diffuse through the tooth or will reflect less light  and results in effective bleaching. The concentration of hydrogen peroxide is relatively high when used for in office procedures which are the range of 30-35% . The high concentration results in deleterious effects on tooth structure, pulp tissues and mucosal tissues of the mouth with subsequent postoperative sensitivity [9,10]. Therefore the efforts were made in the direction of reducing its concentration and achieving the same bleaching efficacy without any adverse consequences. Bleaching efficacy has been evaluated by various subjective and objective methods such as value oriented shade guides, colorimeter and digitized photographs. The subjective methods are done with visual analysis, are not reproducible and are effected by various factors such as lighting, eye fatigue, observers experience while objective methods provides parametric data which can be subjected to statistical analysis . Dentin hypersensitivity post bleaching treatment has been experienced by the patients and results in discomfort and discontinuation of the treatment. Teeth sensitivity is associated with higher concentrations and longer application time with the bleaching product [12,13]. Recently nitrogen duped visible light activating titanium dioxide which acts as photo catalyst has been added in inoffice vital bleaching materials. The addition of titanium dioxide lowers the concentration of hydrogen peroxide by accelerating its breakdown and enhancing the rate of bleaching . Various studies have been published using this material. Thus this paper emphasizes on systematic review of the studies published in the dental journals involving titanium dioxide as photo catalyst for in office vital bleaching with hydrogen peroxide on bleaching efficacy and tooth sensitivity. The literature was searched with predefined inclusion and exclusion criteria (Table 1) on Google and Pubmed in August 2016 with the keyword of Titanium dioxide dental bleaching, hydrogen peroxide and titanium dioxide dental bleaching, Tooth bleaching. The articles found were further searched in their references. Table 1. Criteria for inclusion and exclusion of studies. Data was recorded in the following headings for qualitative analysis: Type of study, sample size, age group, bleaching material used, treatment time and hybrid light used with specifications, bleaching efficacy, tooth sensitivity. The search resulted in total of 45 articles and after removal of duplication resulted in 21 articles. The 16 studies were excluded (invitro studies (9), case report (4), opinion (1), clinical studies (2)) and five studies 1, 2, 3, 4, 5 were included for this review (Figure 1). 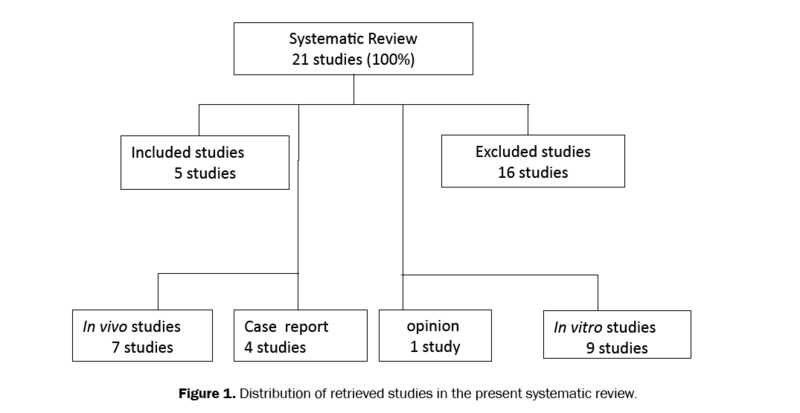 Figure 1: Distribution of retrieved studies in the present systematic review. The included studies were double or triple blind randomized clinical trial with split or parallel study design having a minimum of 20 patients in each group of 18-37years. The teeth bleached were either from first premolar to first premolar or canine to canine in upper arch or all anterior teeth .The Bleaching time, Bleaching efficacy and Dentinal sensitivity of the included studies were shown in Table 2. Table 2. Titanium dioxide bleaching activation (clinical trials). Martin Double blinded randomized, split mouth study (Patient and Evaluator) 30, 30 for both groups over 18 years of age 8 teeth between first premolar (Upper) GI: NS; 6% H2O2 containing TiO2, GII: NS; 35% H2O2 GI and GII 2 (12 mins); 3 (24 mins); 72 mins Interval between session was 7 days GI and GII: With Photocatalyzation For each application continuous irradiation for 12 mins Bleaching Lase Plus, Blue hybrid light with an infrared laser NS, 1500 mW value-oriented shade guide (Vita classical) and Spectrophotometer (Vita Easyshade Compact); Custom guide; Positioned in the middle third of the labial surface within the area of 6 mm of the right and left central incisor immediately after First, Second and Third Session, one week and one month after the Third session Shade by change in no of shade guide units from baseline and LAB parameter and color alteration from baseline by Delta E Teeth bleached with 35% bleaching compound had greater effectiveness however 6% compound was considered effective. Self completed forms after each session and clinical evaluation using VAS used a 100 mm scale by patients; Yes or no reporting of sensitivity; Intensity: None, mild, moderate, considerable, severe 6% hydrogen peroxide with nitrogen-doped titanium dioxide light activated agent showed no clinical differences to 35% agent in tooth sensitivity. This systematic review was conducted to evaluate the bleaching efficacy and tooth sensitivity of an in office hydrogen peroxide and nitrogen duped visible light titanium dioxide (VLTiO2) based bleaching agent in randomized clinical trials. The inoffice bleaching material hydrogen peroxide (either 6% or 15%) catalyzed by nitrogen duped visible light titanium dioxide activated by hybrid LED/laser light was compared with 35% hydrogen peroxide used alone and activated by Hybrid LED/Laser light. The bleaching effectiveness was measured by comparing the tooth colour with baseline before application from immediately or after 1 week or 1 month after product application in the included studies. Hussan et al. in his systematic review found that the studies had measured effectiveness immediately after 2 weeks of product application . The bleaching agent application was done in one, two or a maximum of three sessions. This may be due to the finding that one session was sufficient for noticeable degree of whitening but the rate of color regression was decreased with two sessions over one session . The color assessment in the included studies was done with digital spectrophotometer with or without value oriented shade. Bleaching effectiveness of lower concentration of hydrogen peroxide with titanium dioxide compared with 35% hydrogen peroxide used alone has resulted in either no clinical difference between the groups  or greater bleaching efficacy . The greater efficacy was justified on the basis of using LED/laser light and heterogenous advanced oxidative process modulated by TiO_N nanoparticles . However another study found  that lower concentration has given the lowest bleaching result which was explained on the basis of the bleaching protocol used in the clinical trial has resulted in reduced contact time of 6% hydrogen peroxide with nitrogen duped titanium dioxide by half the recommended time as proposed by the manufacturer . It was found that the sensitivity and bleaching outcome has been related to the concentration and the total application time of the bleaching agent on the tooth structure [12,13]. The higher concentration and more contact time leads to ingress of hydrogen peroxide and its degradation product in the pulp chamber producing a reversible inflammatory response . The previous study  on contact time has found that the three application of 15 mins in office bleaching rather than single application of 45 mins with 35% of hydrogen peroxide has resulted in effective bleaching efficacy and reduced tooth sensitivity. It was observed that the combination of nitrogen duped TiO2 activated by visible light to hydrogen peroxide leads to its lower concentration and causes less dentinal sensitivity after treatment. Also these contemporary bleaching agents are safer and more efficient than the conventional bleaching agents . The included studies also show the similar results. The use of hybrid LED/laser light resulted in effective bleaching efficacy and reduced tooth sensitivity with 15% hydrogen peroxide compared when compared with 35% hydrogen peroxide [1,3]. Also previous study  has found that the use of hybrid LED/Laser light resulted in a significant reduction of tooth sensitivity and the treatment time was reduced by 53% with the same bleaching efficacy with 35% hydrogen peroxide without the light source. This may be explained by the efficacy of the hybrid light which causes little change in pulp chamber temperature and the temperature increase did not exceed 2°C, at the same time it resulted in polarization of the nerve fibres and leading to reduced sensitivity in both the groups . The results of in vitro study  in rat experimental model have observed less inflammatory response of the pulp chamber when compared with in office bleaching without hybrid activation irrespective of the concentration of bleaching agent used which indicates the therapeutic effect of the infrared laser in the hybrid light. Dentin hypersensitivity can be assessed either by stimulus based assessment or response based assessment. The stimulus based method uses stimulus intensity to provoke pain while response based methods needs subjective evaluation of the pain produced by a defined stimulus . The dentin hypersensitivity may be different for different stimuli therefore it is advised that at least two different stimuli should be used in stimulus based methods . The tooth sensitivity was evaluated in the included studies in terms of occurrence [2,4], intensity [2,4], duration  and type  and these were noted in the self-completed forms by the patient after each bleaching session. The patients were also provided 100 mm visual analog scale [1-3,5] and were asked to respond by VAS scoring when the upper central incisors were stimulated by activating an air syringe for 2 s at a distance of 1 cm from the tooth surface. In regards to occurrence of tooth sensitivity there was statistically significant difference [1,3,4] between the groups. The 35% hydrogen peroxide treatment has resulted in highest intensity and longer duration of sensitivity than 6% hydrogen peroxide . However no difference  between the groups was also reported and this was explained on the use of infrared laser which resulted in polarization of the nerve fibres and subsequently the reduced sensitivity in both the groups. 1. The recently introduced nitrogen duped titanium dioxide when added to low concentration of hydrogen peroxide has resulted in effective tooth bleaching and good clinical results with less dentinal sensitivity. 2. The hybrid lights (LED and Laser) used has resulted in better results. The studies have evaluated the results for a short term follow ups. Further studies are needed to evaluate the long term clinical results. Bortolatto JF, et al. Low Concentration H2O2/TiO_N in Office Bleaching: A Randomized Clinical Trial. J Dent Res. 2014;93:66S-71S. Martın J, et al. Effectiveness of 6% hydrogen peroxide concentration for tooth bleaching - A double-blind, randomized clinical trial. J Dent. 2015;43:965-972. Martín J, et al. Can an LED-laser hybrid light help to decrease hydrogen peroxide concentration while maintaining effectiveness in teeth bleaching. Laser Phys. 2015;25:1-5. Bortolatto JF, et al. A novel approach for in-office tooth bleaching with 6% H2O2/TiO_N and LED/ laser system-a controlled, triple-blinded, randomized clinical trial. Lasers Med Sci. 2016;31:437. Martin J, et al. Dentin hypersensitivity after teeth bleaching with in-office systems, randomized clinical trial. Am J Dent. 2013;26:10-14. Luk K, et al. Effect of light energy on peroxide tooth bleaching. JADA. 2004;135:194-201. Sulieman MA. An overview of tooth-bleaching techniques: chemistry, safety and efficacy. Periodontol 2000. 2008;48:148-169. Walsh LJ. Safety issues relating to the use of hydrogen peroxide in dentistry. Aust Dent J. 2000;45:257-269. Dahl JE and Pallesen U. Tooth bleaching-a critical review of the biological aspects. Crit Rev Oral Biol Med. 2003;14:292-304. Goldberg M, et al. Undesirable and adverse effects of tooth whitening products: a review. Clin Oral Invest. 2010;14:1-10. Kishi A, et al. Effects of light units on tooth bleaching with visible light activating titanium dioxide photocatalyst . Dent Mater J. 2011;30:723-729. Tooth whitening/bleaching: Treatment considerations for dentists and their subjects. ADA Council on Scientific Affairs. 2009. Heymann HO. Tooth whitening: facts and fallacies. Br Dent J. 2005;198:514. Hasson H, et al. Home-based chemically-induced whitening of teeth in adults. Cochrane Database Syst Rev. 2006;8:CD006202. Al Quran, et al. Efficacy and persistence of tooth bleaching using a diode laser with three different treatment regimens. Eur J Esthet Dent. 2011;6:436-445. Marson FC, et al. Penetration of hydrogen peroxide and degradation rate of different bleaching products. Oper Dent. 2014;40:72-79. Reis A, et al. Clinical effects of prolonged application time of an in-office bleaching gel. Oper Dent. 2011;36:590-596. Maetani T, et al. An investigation of application of novel tooth bleaching using low concentration of hydrogen peroxide—dental application of electron spin resonance (ESR) technique for detecting reactive oxygen species. Oral Ther Pharmacol. 2008;27:109-115. Bartolatto JF, et al. Effect of LED-laser hybrid light on bleaching effectiveness and tooth sensitivity: a randomized clinical study. Laser Phys Lett. 2013;10:085601. Münchow EA, et al. In-Office tooth bleaching treatment using light-activated hydrogen peroxide agent: a case report. JSM Dent. 2014;2:1020. Gillam DG, et al. A pilot assessment of alternative methods of quantifying dental pain with particular reference to dentine hypersensitivity. Community Dent Health. 1997;14:92-96. Holland GR, et al. Guidelines for the design and conduct of clinical trials on dentine hypersensitivity. J Clin Periodontol. 1997;24:808-813.